Jason and I wanted to send an e-mail out and let all of you know about the changes we are getting ready to go through as a family. As most of you know I was planning on having a home birth using a midwife we were really excited about doing this but God had a different plan. God has always been so faithful to take care of us! We went to the midwives office on August 12th for our first sonogram I was already 19 weeks and we couldn't wait to see our baby. Jason, Destinee, Kenya, my Mom (and of course myself) were all there. Kenya was so cute she kept saying "baby mommy belly" I think she understood that the baby on the TV was the baby in my belly. As the sonogram guy Kevin was doing the sonogram I kept seeing another head so I ask, "Is that another head?" Kevin said, "Yes." I said, "We are having twins?" he said "Yes". We were all so excited! I remember saying, "I have always wanted twins" and Dee kept saying "Your having twins!" He kept measuring one of the babies brains and then said, "I'm going to go get your midwife and show her this". Everyone was so excited and I remember saying, "I'm not going to be excited until he says that the other baby is ok." because he hadn't said anything about the other baby. So they both came back into the room and he was showing her the heads and then he started looking at their stomach and the midwife said, "Vanessa, it looks like their conjoined." I started crying for a few minutes and then the Lord just comforted me I remember saying, "Well, these are our babies and we are going too take care of them and love them no matter what." I also remember saying, "I am so thankful that God gave us these babies and not someone who wouldn't take care of them." 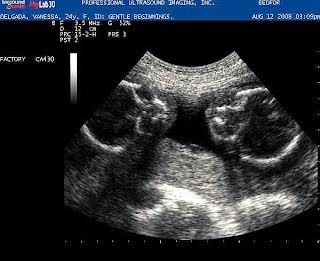 Kevin kept doing the sonogram getting measurements and started explaining to us how twins become conjoined. Their measurements looked good they were both measuring at 19 weeks. At this point all we knew is that they are facing each other and are joined from their chests to about their belly buttons. We knew they had their own bladders but it looked like they shared a heart. Our midwife told us that she would make an appointment with the specialist hopefully by Friday. We ended up getting an appointment almost a full week later on August 18th, I'm pretty sure this was the longest week of my life! The Lord was so faithful though I really felt like He was preparing me my whole pregnancy for this. I just started having such a huge heart for special needs kids like never before. I remember praying a few times asking the Lord to be glorified if He chose to give us a kid with special needs. So I was ready to hear the news but of course at the same time I was blown away by it. So now its Monday the 18th and we got to see the specialist. 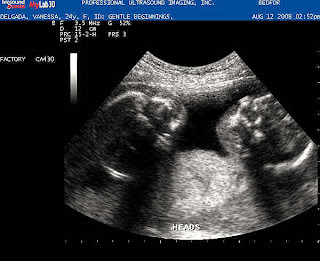 First his sonogram tech came in and was taking all the measurements of their heads, legs things like that. So we talked to her for a while in the ten years she had been doing sonograms this was only the second set of conjoined twins that she had ever seen (and the first set of conjoined twins she saw that morning). She was really sweet she had no clue how we were holding it together and we told her that is was the Lord. We knew He was the one forming them in my womb and that He would be glorified through this. So then the doctor came in and started doing his measurements he began to explain to us where they were conjoined and he told us that they shared a liver which wasn't a big deal but that they also shared a heart so we would not be able to separate them. We said ok we were already prepared to hear that I had already been thinking all week about the stuff I could invent for them to play in so they wouldn't always be laying down. Then he started explaining more about their heart; it only had one ventricle which wasn't enough for one baby let alone two. He said I would most likely have a miscarriage but if I did make it to full term that they wouldn't live long after birth because their chest cavity was underdeveloped which meant that they lungs most likely wouldn't develop. So he said whenever I went into labor they would deliver the babies by csection hand them to us and let us hold them until they passed on. I couldn't believe it I asked him a few questions then lost it. I was still comforted in knowing that God was in control but no parent wants to ever hear that. So that's what is going on with us. Oh I forgot to tell you all we are having identical twin girls named Madison Hope and Melody Joy. We are so excited about our babies and are just fully trusting the Lord Jesus Christ, He is ur hope. We know that His ways are far better than ours and He is completely sovereign over all things! This did not surprise Him, He allowed it to happen, and even ordained it to happen, this is His will,... for our good and for His glory and we are just so thankful that He gave us these babies! For some that last sentence may be controversial, confusing, radical, or even erronious, but we are convincenced from the Bible that they are absolutely true, even though some of them may be hard to swallow, and I find more comfort in the truth of God (even when it is hard) than any false comfort man can provide. - Why pray if God is in control? And whose prayers does God hear? - How can God use suffering (or allow evil) for His glory? - Who is ultimately responsible for this? God or Satan? - Is their comfort in knowing God knew this would happen, and yet He did not stop it? - Why Christ Jesus is worth more than any earthly treasure. As times goes on I may re-phrase these questions as I think and study more through these issues but we will see. Also, please feel free to comment on this and ask us any questions you may have, regarding the babies or the Bible or whatever. 7) We would be bold witness' for Christ during this time! We love you all and will keep you updated. Kenya's friend Noah turned 1! All Kenya wanted from all the candy was a sucker. She had a blue mouth and blue drool running down her face. and Andrew had fun playing together. Noah 12 months, Kenya 21 months, Elisabeth 16 months, Jadyn 8 months and Andrew 7 months! Kenya loves all of her friends even though you can't tell by this picture. I haven't talked a lot about Jason on here so let me just start out by saying I have the BEST HUSBAND EVER! Jason is always there for me. He has helped me out so much with this pregnancy I know I could not even begin to name all the things he has done but I will try to name a few. In the 1st trimester I was a crazy person when it came to eating if I wanted soup from Chili's that's all I wanted and nothing else would do. Let me just say looking back I was very selfish and demanding but my sweet husband did everything he could to make me happy with in reason. If I was just being ridiculous he would tell me in the kindest way possible. Now that I'm getting bigger and feeling the weight he has taken over with Kenya when he is home he plays with her reads her books and just loves on her (he has always done those things he just does then a lot more now). If we are out running around he puts her in the car and gets her out he also keeps her entertained while we are in the store. I love watching them together! Now on to my husbands musical talent. Jason can play ANY instrument you put in front of him. I think my favorite thing to listen to him play is the guitar. God has blessed him with many talents and he is so humble about them all. I love bragging on my Husband but really all the glory needs to go to God for creating Jason and making him the way he is! I love you babe! Ok these pictures are of Scott and Jason Jamming. They sound really good together but it's really loud so I couldn't stay in there for too long! I haven't seen my friend Laura since Kenya was just a few months old and it's been even longer since I have seen her Mom Julie who is also a good friend of mine. So we decided to have a play date with Kenya and the little girl that Laura watches Parker. They had so much fun. They played with Julie's amazing toy that she invented. I can't believe I didn't take a picture of it. I don't want to say too much in case she puts a copy right on it lets just say I never knew and empty container and the lids to soap could be so much fun! Kenya and Parker loved jumping on the bed! This is Parker telling Kenya she is sorry for something??? I thought it was cute! I think it took Kenya a total of three minutes to fall asleep in the car on the way home! It was a fun day! Mandy, Shannon and I had the bright idea to go garage selling with four babies. It's times like these I'm so thankful I have a van. We left around eight and had a lot of fun the babies did GREAT. We were able to go to a lot of garage sells and found lots of fun things. In fact we had so much fun that we decided to do it again the next day. After which I had to ground my self FOR THE REST OF MY LIFE from ever going to a garage sell again. I found lots of GREAT things I did not need and I got them all. I might add that I got a lot of things for free, but still no more garage sells for me. I had the joy of watching three three month old's and of course Kenya; we had a fun but VERY busy day. Destinee was home and helped me out a lot. Kenya was loving it. She would just go from baby to baby making sure they were all o.k. She would talk and talk to them and if they were crying she would say Mommy Eli needs passie. It was so cute! I thought it would be fun to do a mini photo session with all the babies. Well I wasn't able to get a great picture of all of them but this is the best we got. Kenya wanted to join in the fun! Right to left we have Seth, Sadie and Eli. Kenya never falls asleep while I'm holding her. This was a special moment! My Mom wanted to share in the cuteness! We started a new family tradition... Every Sunday before church we go to Grrrrrrama and Gramps' house for lunch. We love getting to spend time with the family while enjoying some goooooood cooking. This was our meal of baked beans, meatloaf, mashed potatoes and chocolate cake!!!!!!! It was soooooo good. So I tricked them I said one then took the picture they didn't have a chance to be goofy and I got the picture I wanted! Kenya thought they were so funny. Riley (my friend Taylore's little girl) turned 4 and we were there to celebrate! I think this is the first little kid party we have been to that Kenya was old enough to enjoy. She was a little shy at first which is normal but once she warmed up she had a blast. Riley was so cute she loved her birthday party. On the way home Kenya was singing Happy Darbay to you Happy Darbay to you. It was so cute she remembered the song! Kenya's favorite thing was the bounce house. She didn't want to get out. This is her trying to make a basket. Notice how she dropped it behind her head. We will have to work on her basketball skills later!